What is the West Maui Ridge to Reef Initiative? The West Maui Ridge to Reef (R2R) Initiative is an all- encompassing approach across multiple agencies and organizations to address adverse impacts to coral reefs in West Maui. The State recognized that an integrated and comprehensive approach to reduce land-based sources of pollution is one of the most important steps to help restore coral reef ecosystems. The R2R Initiative builds on already established efforts underway and leverages resources across a number of agencies and community groups to implement actions to reduce one of the key sources of reef decline – land-based sources of pollution. To restore and enhance the health and resiliency of West Maui coral reefs and near-shore waters through the reduction of land-based pollution threats from the summit of Pu`u Kukui to the outer reef. These efforts will be guided by the values and traditions of West Maui. Peruse through to learn about the R2R, better understand the health of your watershed from ridge to reef, and discover ways to get involved so that the West Maui you love will be thriving for your kids & their kids too! Check back often for updated information on projects and community opportunities. This site is managed by the West Maui Watershed & Coastal Management Coordinator who is contracted through the West Maui Soil and Water Conservation District working in support of the goals of the R2R. Priority Status: The Hawaii Coral Reef Strategy identified the coral reef ecosystem along the West Maui region as a priority management area. 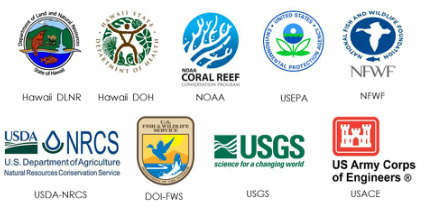 The US Coral Reef Task Force designated West Maui Watersheds as a priority partnership in the Pacific in 2011, beginning with Wahikuli and Honokōwai, and now including Kahana, Honokahua and Honolua. The full R2R project area includes 24,000 acres from Kā`anapali northward to Honolua and from the summit of Pu`u Kukui to the outer reef. In April 2015, West Maui was designated as a Resilient Land and Waters Initiative site by the Department of the Interior, the Environmental Protection Agency and the National Oceanic and Atmospheric Administration. Ongoing and future work: The R2R Initiative seeks to build on existing work in West Maui. The Watershed Management Plan for Wahikuli and Honokōwai funded by NOAA was completed in Dec 2012, and is now in the implementation phase. Planning for Kahana, Honokahua and Honolua Watersheds is underway and was completed 2016. These plans, along with ongoing research efforts help direct the priorities of the Initiative. The working group is comprised of thirteen members that represent key interests in West Maui. It is chaired by Dept. of Land and Natural Resources Division of Aquatic Resources (DAR) and facilitated by the West Maui Watershed Coordinator. Members represent interests in agriculture, land development, resort operation, soil conservation, traditional Native Hawaiian knowledge, non-profit marine conservation, coastal water quality interests, recreational ocean users, Maui County and fishing. The Working Group supports the R2R Initiative by serving as a local body providing community input to the FAST (see below). The working group also acts as liaisons to coordinate and communicate information and efforts undertaken by community partners to the FAST and visa versa, as well as a mechanism for the two-way flow of information with the representative constituents which the working group members represent. (Pictured from left to right: Wayne Hedani, Liz Foote, Wes Crile, Russell Sparks, John Smith, Steve Parabicoli, Chris Brosius, Ekolu Lindsey, Rob Parsons, Chana Makale'a Ane (alternate for Pomaika`i Kaniaupio Crozier), Tova Callender, Tara Owens. Missing: Felimon Sedang, Meghan Dailer, Jennifer Vander Veur. These partner agencies and organizations form the Funding and Agency Support Team (FAST), which is the leadership body for the Initiative. The FAST meets at regular intervals to provide oversight in managing funds, prioritize activities and develop strategies to achieve the R2R goals. More information about the R2R can be found at the Hawaii Coral Reef Strategy website.